Somewhere along the line, my husband and I decided we really liked donuts [Okay, maybe I always knew that I really liked donuts]. We also really like trying new places. Combine donuts + new places, and you've pretty much uncovered our Saturday morning tradition. Let me tell you, the Minneapolis/St. Paul metro area has a *lot* of donut options. We've been to quite a few, and yet there are always more to discover. Wanna know our favorites? Or at least mine? Please say "yes" because I'm going to tell you anyway. While this wasn't a hands-down winner, it's definitely on my list of places to re-visit. We stopped in, bought donuts, and drove all the way home before consuming them. Unfortunately, this proved to be a mistake as J's donut was greasy + a little underdone. Mine was heavenly, so I really hope we can give them another chance, despite the distance. My expert knowledge [from making donuts once in high school as a 4-H project ... yeah, I'm cool] tells me that their oil was just not hot enough in that batch. Can we really write them off for one little mistake? This bakery was discovered on our way to Mel-O-Glaze [which I don't recommend] and it. is. awesome. Especially if you like cake donuts. On a whim, I went for the chocolate croissant instead [should've waited for the French bakery, but it looked so good! ], however, after tasting a bit of J's and experiencing the perfect crisp crust and incredibly soft crumb, I'm hooked. Not to mention Angry Catfish is two doors down and makes some amazing coffee to go with your donuts. Mmmm. Drooling again. Honestly, the decor in this place is right on par with the donuts. They have metallic gold on turquoise wallpaper, a bright red bench in front of that, and plants hanging from the ceiling. Trendy + quirky. The day we went they were only making cake donuts, which were good, but the real key here is the toppings. They have everything from butterscotch + potato chips to chai glaze. It's a little overwhelming to choose from their selection, but in a good way. Located between a hookah store and Jerusalem Market, I almost hesitate to tell you about this place. It's really small, and it wasn't until Cafe Donuts across the street was torn down that we felt the pull to their bakery. We've never looked back. 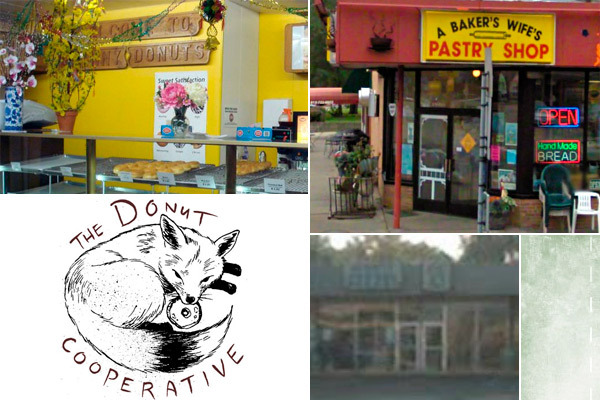 They have a nice selection, excellent flavor, the donuts are never tough, and if you can't resist the bread, well, don't. It's delicious. It also feels like a secret neighborhood hole-in-the-wall that only the insiders know about. And here I am letting the secret out. But they're so good, I couldn't resist. What are the favorites on your list? We're always ready for another adventure! Wow... I love donuts but I have never even contemplated that there are in fact whole bakeries devoted to donuts. This may be dangerous knowledge... My favorite are cake donuts with icing and sprinkles. YUM! Such a bummer that Han's Bakery is no longer in Anoka...their apple fritters were THE BEST! Not to mention they had donuts the size of your head! Their closure was a sad day.